My days lately have been swathed in rain. Even better, it's been a little cold, which is like a special beautiful blessing for me. I wrap myself in a shawl and drink tea and let the breezes coming through my open door tell me their dreams. But I am strange, and society never fails to tell me so. I'm supposed to love the summer, the warmth, the beach. This seems to be one of the rules of the human heart these days. These days there are a lot of rules about love. I know we're getting better on the LGBT front, but the list of ways it's acceptable to love someone, or something, seems to be getting longer and more complicated as we work out how to find balance in our society. As a writer, I find it difficult sometimes. 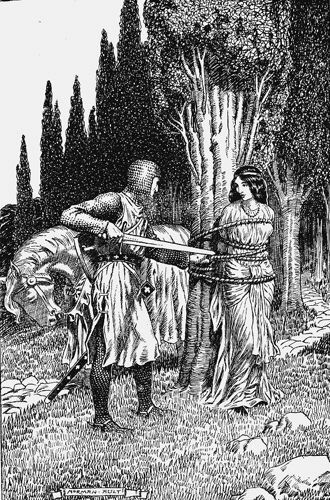 I take my inspiration from the old stories, the mythic tales, which are so often about the coming together in marriage of two different types of power - the king (mind, body) and the maid (heart, soul). To modern sensibilities, it seems like an imbalance of power. We tend to see things politically, and no fault to us that we do, considering the long fight we have waged, and continue to wage, against patriarchy. And now the sky outside is turning luminous, silvery, like the light above the ocean. Another storm is coming. I will run away into the wilds of my heart and love it, no matter what anyone else thinks. So often I find myself reading you, having been absorbed in similar thoughts and impressions. Just this week I was having a conversation with my daughter about a lot of what you write - politics, love, power, patriarchy; as well as identity, and who "owns" certain representations and identifers. Even as someone who supports and cheers on many of these changes, I do find at times, that it can also be complicated, and fraught. Especially as someone immersed in an older symbolism and archetypes as intuitive reference points. "...and no fault to us that we do, considering the long fight we have waged, and continue to wage, against patriarchy." But why fight it? What's wrong with patriarchy? I believe men and women are equal and should share authority and care, and be equally safe, equally respected, equally paid. "I believe men and women are equal and should share authority and care, and be equally safe, equally respected, equally paid." You explain it beautifully here. I wasn't sure what response my question would bring. There is a lot of mistrust of men lately, but many of them didn't do anything wrong and are just bewildered. To me, "fight the patriarchy" sounds like "fight half of humanity." I am the mom of two sons. I want the world to be a good place for them and us. Thanks, Sarah, for your response. Sandi, I'm so sorry for the tardiness of my reply, for some reason your comments don't show up in my mailbox, so I only noticed this one when I was looking at another. I'm a firm believer in equality, especially as the mother of a daughter who competes in a male-dominated sport where the balance is very unequal. But I'm also not against men, infact I write often in sympathy with them. Men are people too. They have vulnerabilities, complexities ... and many of them suffer in patriarchy too. I have no such love for patriarchy and its impacts. my internal world is largely one of visual and verbal poetry, and so I tend to see the outer world. love included... I see my world in fairytale terms; it's how I get at my truths. but not all fairytales are sweet, and not all end happily. I'd say looking at the world in such terms is no less real than any other way. a sacred marriage is about wholeness. I think we can define the wholeness in ways that feel true to us, and I think there is space in the tales for larger, more inclusive kinds of wholeness. balance is always the hardest thing to find. especially after millennia of imbalance. I just posted about something similar the other day ... how my perfect beach day is all wind and clouds and mist, and the scrubby wild plants of the Pacific Northwest clinging to the edges of the bluffs along the shore. I love winter, I love the rain and the long hours of dark ... I need it for dreaming, resting and reflection. I'm in no hurry for spring. I've been equally preoccupied with, as Mary Oliver puts it so beautifully, Letting the soft animal of my body love what it loves. Not putting so many restrictions on my creativity, not trying to follow the "rules" of making art or writing or running a business. Striving to simply be this self without imposing artificial parameters. It's a scary, messy thing to let go of all those models for how to love, isn't it? But it's a vital thing, too. Thanks for your beautiful website, I've been reading and lurking for a while and had to respond to this post because it was so timely for me. Thank you for writing, Michelle :-) I visited your site, it's beautiful.